Forty students from INTI College Sarawak gained an appreciation of the development and contributions of the timber industry in Sarawak with their recent visit to the Sarawak Timber Industry Development Corporation (STIDC). A guided tour of Wisma Sumber Alam which included visits to the Sarawak Timber Museum and the Sarawak Timber Library enabled the visitors to appreciate the vibrant canvas of Sarawak’s timber and wood-based industries. As the leader and catalyst of the timber industry, STIDC ventures into various sectors of the industry with the ultimate goal of bringing about socio-economic and human resource development in Sarawak. The industry plays a significant role in the State’s economic development, transforming primary products like sawn timber and plywood to the production of parts, components and finished items. 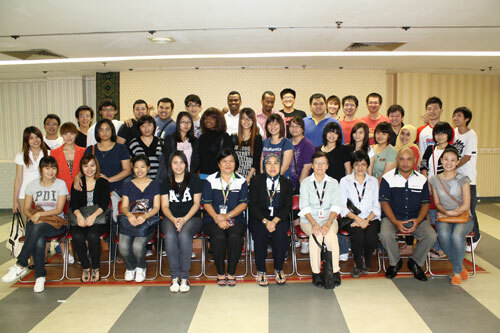 Group photo of INTI’s students at STIDC. Liew Pai Sze, a semester four Bachelor of Arts (Hons) in Business Administration programme student, learned that “STIDC plays a leading role in planning, coordinating and developing the timber and wood-based industries in Sarawak. The visit was an opportunity for us to learn how various managerial functions contribute towards the overall operations of an organization.” She added that it was heartening to learn of the initiatives by STIDC and the industry to succeed in the area of sustainable forest management. Industry visits are an integral part of the holistic learning experience at INTI, facilitating the learning experience of students during the course of their studies. Indeed, gaining knowledge and experience from direct exposure to industry is a step in the right direction as they prepare to be world-ready for today’s global economy. Students of INTI benefit not only from the institution’s over 25 years of experience and strong track-record, but also gain from the global synergy and resources that Laureate International Universities provides. INTI is a part of Laureate, the world’s largest private education network with a presence in 29 countries, with more than 60 accredited universities and 130 campuses, serving more than 740,000 students globally. For further information about INTI College Sarawak and its range of academic programmes, please call 082-570888 or visit INTI College Sarawak at Jalan Stampin Timur in Kuching.